In case you missed it, Apple had a little media event yesterday. Of course, I kid. Yesterday was the keynote presentation at Apple’s WWDC (Worldwide Developer Conference) and it has dominated tech news for the last week.—including the obligatory unveiling of all things magical, like iOS 6. Apple revealed a vast array of new features and capabilities for the next iteration of its mobile operating system. Things like integrating sports scores and news, or movie and theater information into Siri will be welcome, but there are only a few things about iOS 6 that stand out for business users. 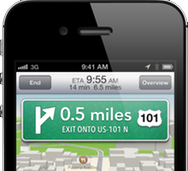 iOS 6 finally brings turn-by-turn navigation to the Maps app. Apple is ditching Google Maps, and switching to its own home-grown mapping app. The best part about the change is that the new Maps app will include turn-by-turn navigation, Yelp integration, and real-time traffic updates. The Garmin StreetPilot app sets the bar pretty high, so it remains to be seen if the iOS 6 Maps app can live up expectations. But, there is no way to assign the Garmin StreetPilot app (or any other third-party mapping app) as the default, so it will be a vast improvement to at least have the default Maps app provide more useful instructions to get your from Point A to Point B.
Siri is a work in progress. Despite attempts by naysayers to compare it to other voice-interaction capabilities, though, Siri is in a league all its own. However, it doesn’t quite live up to how it’s portrayed by Apple marketing and it still has some rough spots. With iOS 6, Siri gets a couple of distinct improvements you might find useful. First, because of the aforementioned changes to the Maps app, when you ask Siri to find a restaurant or gas station it will be able to literally help you find it with turn-by-turn navigation. Another aspect of Siri in iOS 6 that you’ll appreciate is the ability to open apps. The Siri virtual personal assistant will finally come to the iPad with iOS 6. It was a disappointment when the iPad 3---I mean “new iPad”--launched with no Siri. When iOS 6 launches it will bring Siri capabilities to the new iPad, but not its predecessors. The iPad has established itself as a capable mobile computing platform for business, and the addition of Siri will make it even better. You will be able to ask Siri to set a reminder or make an appointment on your calendar from your iPad, just like on the iPhone. Most of the “improvements” made by Apple are capabilities that already exist on other platforms. Android users have enjoyed things like turn-by-turn navigation for quite some time. A comparison by PCWorld illustrates how the different mobile platforms compare against each other. iOS 6 is not revolutionary by any means, but Siri adds an element that doesn’t show up on paper in a comparison chart, yet sets it apart from other mobile platforms. One annoying and frustrating aspect of Apple’s WWDC keynote—at least as it relates to iOS 6—is the time span between announcing the new features and capabilities, and actually making the update available. The new iOS will most likely be made available this fall, coincidentally about the same time that you should expect the next generation iPhone hardware to hit the street.